Hey you, yes, you. You’re not going to always have it together. There are going to be days when you miss the bus, when you leave your credit card in the shoe aisle in Target, when you forget your sack lunch at home. You’ll have days when life is like a hole in your sock, awkward and inconvenient. The type of days when you wake up and nothing seems to be going right. The days you feel defeated just rolling out of bed. You’ll get to the gym and can hardly jog. You’ll feel weak and tired and weird. You’ll have to force yourself to get on the treadmill, force yourself to bump up the speed to at least a fast walk, force yourself to focus, to breathe, to keep going. You’ll get to school or work and can’t stop yawning. You’ll try rubbing your eyes, stretching out of your chair like a fat cat, taking a short walk, and discreetly smacking your cheeks when no one’s looking. But you’ll still feel annoyingly out of it all day. A hole in your sock? Those things are noticeable. Your toes feel this awkward sense of half-freedom, and so they poke themselves out more and more as the day goes on. Your feet get sweaty, probably rub against the ripped sock fabric and drive you crazy. And you look weird, especially when you take your sock off. You just feel off. But everyone has off days. Everyone has hole-in-your-sock days. Days when you’re just…different. You’re not you. Whether it’s school, work, workouts, social time, meetings—you just won’t be yourself. And that’s okay. 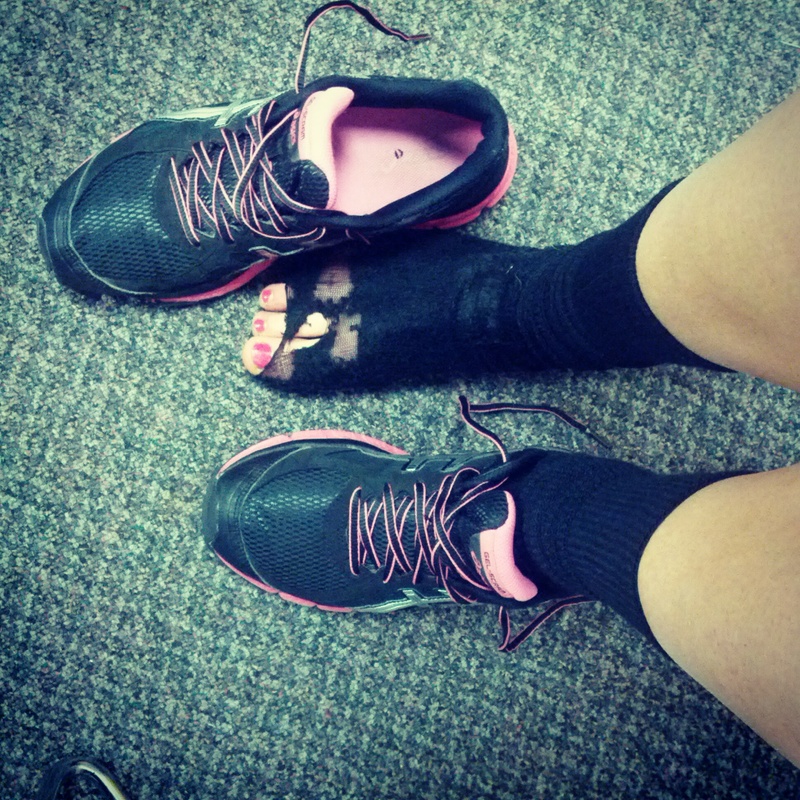 A lesson learned from an ugly-looking, half-ripped sock: you aren’t going to always have it together. You’re going to have days that are inconvenient, frustrating, and unproductive. You’ll have who-am-I days and what-the-heck-is-going-on-with-me days. But the most important thing is that you refresh and restart for tomorrow. Take a nap, take a shower, get seven hours of sleep, just lay down and relax. Do whatever you need to press the re-do button and begin again. What matters most is not what you did, but how you recover. So paint those toenails and go buy a new pair of socks, these ones a little sassy, maybe even bright pink and purple polka dot.